I'm pretty wiped out! I just had a long, long walk around the shops with Pia and that's quite exhausting! We had lunch at Café Lola, a nice little place that served fantastic sandwiches (I have photos, just need to get them from the camera) and salads. And then ice cream at Stockholms Glasshus. (Lemon sorbet and straciatella for me, saffron, pistachios and rosewater and something with chocolate and nuts for Pia.) I bought the most gorgeous foodie necklace, I will have to take a picture of that to show you! Good thing I'm asked to dinner at Tesse and Danne tonight, because I really don't think I'm creative enough to cook anything today. A few weeks ago though, we made this nice mushroom toast. Use a really tasty bread, it will make all the difference here. Brush with olive oil. Slice mushrooms neatly, place on bread, brush with more olive oil, and grill briefly in a sandwich grill. That's all - but it's a really tasty little dish. Serve with a good salad and you're all set for a light evening meal. Or make them in advance and bring them with you for a picnic! I love mushrooms on toast, but there has to be lots of lovely freshly ground pepper! The Bread you have used looks good! Jag älskar Stockholms glasshus, cassata är min favorit! Körsbär suckat och marsala, mm. Ser fram emot att träffa dig igen, hoppas det gick bra med visdomstanden! 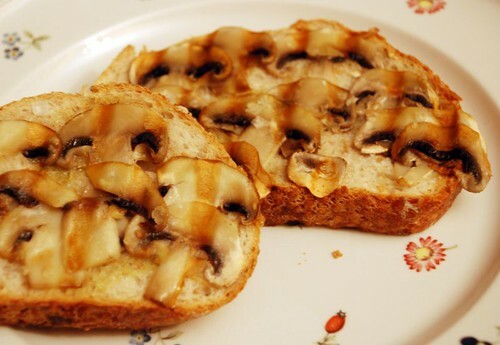 i sure will try this mushroom toast.. my daugther will love it..